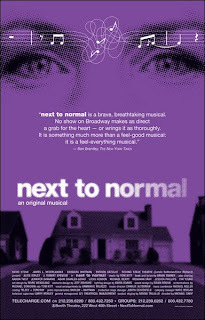 So yesterday, I ventured to 45th St. to try my hand at Next to Normal’s fancy new lotto. I entered my name at 6 p.m. and retreated from the 45-degree drizzle to the covered passageway at the Marriott Marquis. One Scrabble victory on my iPhone later and it was time to report back to the Booth Theatre for the drawing. Since Next to Normal has a bit of a Broadway monopoly on Monday nights as most other shows are dark, I expected a larger crowd. By shrewd estimation, I counted 25 to 30 people. The theater representative announced there were 26 seats up for grabs—more than the usual 18 I’ve heard for this show. Maybe not enough people know about the Monday night performances. The names kept being pulled and none were mine. Particularly grating was the fact that most of the winners only wanted one ticket (like me), so more names being called that weren’t mine was even more torture. The theater rep announced there was only one seat left. Just under the wire, he pulled my entry! I was definitely amused by the timing. Of course, a lottery is only satisfactory if you win it. But victory aside, the lotto is still two tickets for $25 each with great seating. Next to Normal is still one of the best rush deals on Broadway.